At the Target step of the wizard, select the destination for disk export and format in which you want to save the resulting virtual disk. From the Server list, select a server on which the resulting virtual disks must be saved. If you plan to save the disks in the VMDK format on a datastore, select an ESX(i) host to which this datastore is connected. In the Path to folder field, specify a folder on the server or datastore where the virtual disks must be placed. VMDK — select this option if you want to save the resulting virtual disk in the VMware VMDK format. VHD — select this option if you want to save resulting virtual disk in the Microsoft Hyper-V VHD format. 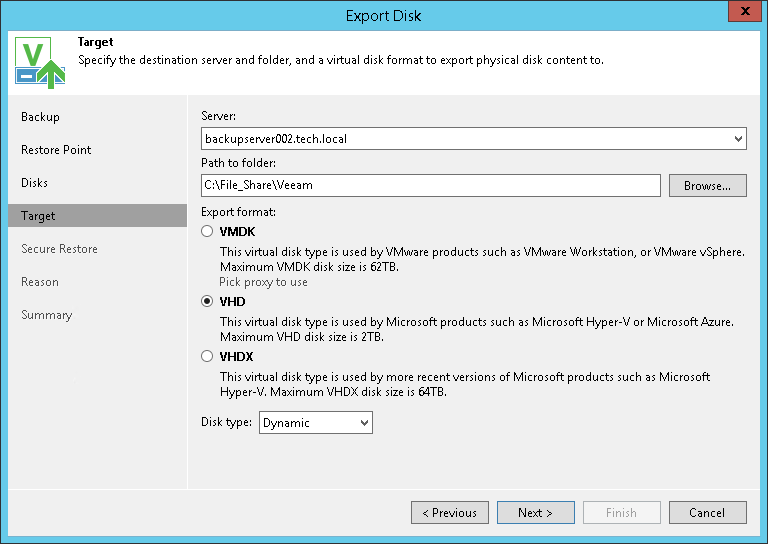 VHDX — select this option if you want to save resulting virtual disk in the Microsoft Hyper-V VHDX format (supported by Microsoft Windows Server 2012 and later). If you have selected to store the resulting virtual disk to a datastore, you will be able to save the virtual disk in the VMDK format only. Other options will be disabled.